His Eminence, the Most Reverend Archbishop Mark (born Alan Maymon; June 22, 1958, New Albany, Indiana) is Archbishop of Philadelphia and Eastern Pennsylvania of the Orthodox Church in America. Formerly the bishop of Toledo under the Antiochian Orthodox Christian Archdiocese of North America, he was received in the OCA during December 2010 after his release by Metr. Philip of the Self-Ruled Antiochian Orthodox Christian Archdiocese of North America. Alan Maymon was born in New Albany, Indiana on June 22, 1958 and baptized in the Roman Catholic Church. After graduation from high school in 1976 he attended Indiana University South East before transferring to Oral Roberts University in Tulsa, Oklahoma from which he received a Bachelor of Arts degree in 1985. In 1987, he received a Master of Arts degree in Biblical Literature from Oral Roberts University where he accepted a position as Adjunct Professor of Old Testament. Introduced to Orthodox Christianity by Fr. George Eber and his professors of Church History, Dr Jerry Sandidge and his Old Testament Professor, Dr Howard Ervin, Bp. Mark was received into the Orthodox Church through Holy Chrismation on Holy Wednesday, 1989. With the blessing of Metropolitan Philip, he then attended St. Vladimir's Orthodox Theological Seminary in Crestwood, New York, where in 1991 he earned a Master of Divinity degree. He worked at the Antiochian Village from 1991 to 1993 before moving to New Kensington, Pennsylvania, to assist Fr John Abdalah, at the same time working as a Mental Health worker at Mercy Psychiatric from 1993-1997, then from 1997-2001 as a crisis worker in the emergency room at University of Pittsburgh Medical Centre in Aliquippa, Pennsylvania. Bp. Mark was ordained a deacon at St Mary Antiochian Orthodox Church, Wilkes Barre, Pennsylvania by Bp. Antoun on August 17, 1997; and on September 7, 1997, he was ordained to the priesthood at St George Antiochian Orthodox Church in Pittsburgh, Pennsylvania, in the Antiochian Archdiocese. He served as pastor of St. John's Antiochian Orthodox Church in Beaver Falls, Pennsylvania from 1997 to 2000, before being assigned to be assistant priest at St. George Antiochian Orthodox Church in Grand Rapids, Michigan, replacing Fr John Estephan on his retirement in December 2002. In 2004, he was elected bishop by the local synod of the Antiochian Archdiocese. On December 5, 2004, he was consecrated at the Patriarchal Cathedral in Damascus, Syria by Patr. Ignatius IV and other bishops. He was then enthroned as Bishop of the Diocese of Toledo and the Midwest at St. George Cathedral in Toledo, Ohio on August 25, 2005. After some difficulties regarding the status of the Local Synod in the Antiochian Orthodox Christian Archdiocese of North America, Bp. Mark refused a transfer from his see and requested a release to the Orthodox Church in America, which was officially granted on December 8, 2010. Effective January 1, 2011, Bp. 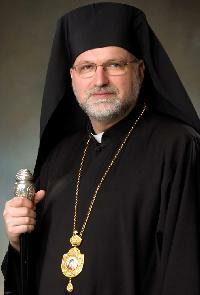 Mark served as Auxiliary to Metropolitan Jonah of Washington, ruling metropolitan of the OCA, with the title "Bishop of Baltimore", and was administrator of the OCA Diocese of the South and Synodal Liaison for Departments and Commissions of the Orthodox Church in America. November 13, 2012 he was appointed administrator of the Diocese of Philadelphia and Eastern Pennsylvania. On March, 18, 2014, he was elected by the members of the Holy Synod of Bishops of the Orthodox Church in America to fill the vacant Episcopal See of Philadelphia and Eastern Pennsylvania. In March 2015, at the Spring session of the Holy Synod, Bp Mark was elevated to the rank of Archbishop. Biographical Information, submitted to the Diocese of the South (OCA) Episcopal Search Committee. This page was last edited on April 27, 2015, at 12:41. This page has been accessed 40,802 times.